SURVIVOR STORY: STROKE. LIFE CHANGING. MY STORY. The following is from Karen Jarnat a Stroke Survivor who is allowing us to share her personal story. January 4, 2015, a day that has forever changed MY life and the lives of my family. It started out to be a “normal” day. I had decided to work over time as my husband and I had panned to go to Arizona in three months to watch our beloved Chicago White Sox during Spring Training. I had been at work less than a ½ hour when I, a relatively healthy 41 year old woman, suffered a right side hemorrhagic stroke. I was taken to the closest hospital, stabilized, and then transferred to the Stroke Center at a leading hospital in the heart of Dallas, Texas. After two weeks of testing and making sure I wasn’t in immediate danger for subsequent strokes, I began my in-patient rehabilitation. Since the initial shock of having the Stroke was gone and the psychological impact was beginning to set in, the Doctors told my husband to bring something from home that could bring me comfort. This item or items could be family photos or pajamas or even the pillow I use from our bed. Without any discussion, my husband brought me my favorite blanket – MY CHICAGO WHITE SOX blanket!! This move left some staff members stunned. The stroke I suffered left me with significant left side physical deficits, it also left me with cognitive deficiencies and memory issues. Since I was getting physical therapy, my husband began talking to me about baseball. As an older couple that just found true love in each other, we had two thing we loved to do – traveling and watching sports!! My husband and I would spend time on my hospital bed talking about the rules of baseball and the CHICAGO WHITE SOX, our favorite team. We didn’t make it to Spring Training that year. But because of all our hospital talks, I was ready to watch the upcoming season from home! YES, home. 29 days later I was going home.. I'm not saying it was easy. Albeit with my leg brace and cane, we still make it to a few games in person both in Dallas and Chicago. Sometimes we have to just have to watch from home. I still have many bad days. Days that prohibit me from doing things physically and days I'm just down and days I have trouble with my memory. On those days, we circle back to stories and talks about the CHICAGO WHITE SOX. Through my recovery, I have lost a lot friends. Whether be because life changes or because of my limited ability to do things socially and some because they can’t cope with seeing me change. One thing's for sure. The CHICAGO WHITE SOX have NEVER, NEVER turned their back on me!! They will always be important to me, as our team. But for me, they were and are important in my recovery!! Want To See A Camp In Action? This may look like a very short blog article but if you click on the link below you will get an eight minute slide show that I made of the Rockford, Illinois Stroke Camp the weekend of August 24-26. Eight minutes may sound like a long time but you will be so captivated by it you won't even notice it. If you've ever wondered what it is that we do at a camp, this is your chance to find out. This year our theme is Stroke Camp Island Getaway. Do You Know How Many Camps We Do Each Year? If you have been reading our blog posts here you probably know much of what we are all about. What you might not know is the extent of what we do. Listed below is this year's camps, their locations and the sponsors for the camp. You might also notice that we can have up to three camps on the same weekend, which are most likely in three different states. Each camp will have three or four experienced volunteers from the Peoria, Illinois who will travel to these locations to lead and manage the activities. As you can see, we may have as many as twelve volunteers staffing camps on any given weekend. We have been at this since 2004, starting out with one local camp and blossoming to the thirty, all over the country, you see listed here. It is, and has been, an amazing journey. We enjoy it, and we get to see the difference our camps make in a survivor's and caregiver's life. Check this list out and see if your city has one. If not, ask the Stroke Coordinator at your Hospital Stroke Center or the leader of your local Stroke Group to contact us...or you can even call us yourself - (309)688-5450 or email us at info@strokecamp.org. Do you want to see what goes on at our camps? Next week I will post some photos to give you an idea. Since September is Atrial Fibrillation Month I have posted the below article from the American Heart Association. I believe this is appropriate for a stroke blog since AF can lead to a stroke. Normally, your heart contracts and relaxes to a regular beat. In atrial fibrillation, the upper chambers of the heart (the atria) beat irregularly (quiver) instead of beating effectively to move blood into the ventriclesIf a clot breaks off, enters the bloodstream and lodges in an artery leading to the brain, a stroke results. 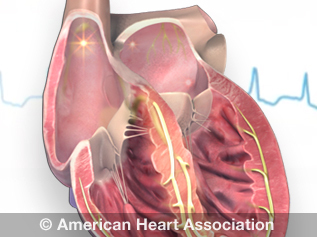 About 15–20 percent of people who have strokes have this heart arrhythmia. This clot risk is why patients with this condition are put on blood thinners. Less than half of AF patients believe they have an increased risk for stroke or heart-related hospitalizations or death.